My sister and brother-in-law are downsizing, preparing to move into a condominium. * I should have known to be wary of gifts when entering their house.I place no sentimental value on my grandmother's oversized formal furniture, and, thank you, our house has enough stuff. Meryll told me she has a present – beware of Greeks bearing gifts, sisters downsizing. She handed me a picture of three children staring at a camera frozen in time.There wasn't a lot to give away anything about who these children might be or their personalities, but I recognized my sister and brother, so I deduced that the four-year-old was me. Actually, we removed the picture from the frame to check the date and saw the photographer's name. I remember him as dour, Mr. Neuron. I didn't understand why I had such an aversive reaction to the picture. Meryll was decked out in her royal feminine regalia, long-haired gently curled, a dress with little flowers attached looking like the precious little girl that she was. 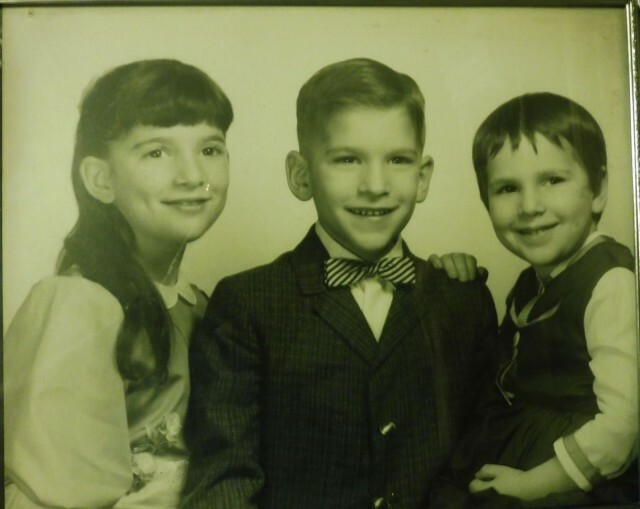 Seven-year-old Chuck wore a wool jacket and snappy bow tie. 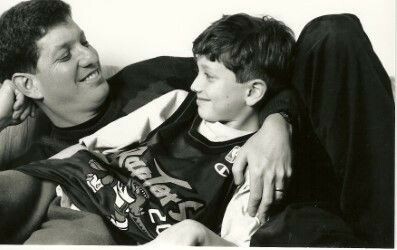 My hand was on his shoulder, a position that I never replicated in real life except when given piggy back rides. As far as four-year-old me, I remember the pixie haircut all too well, but I thought I would probably have preferred pants to the dress.The strangest part was the idea of sitting still. I was a whirling dervish. I remember being fascinated how adults could sit in chairs so long and just talk. Why don't I like this photo?I think it captured our faces, but nothing more.For me, growing up in the late 50's and 60's was like a growing up in a bubble (to use Vera and Alisa's term) that was very pleasant, predictable and loving, but, I couldn't wait to break out. My energy was too much for that photo, too much for the suburb, too much to stay quiet or settled. It was a world where we posed and were staged. Our parents did a terrific job of providing for us and making us feel safe. Once we hit the mid 60's, things got more interesting in terms of the civil rights movement, the Vietnam protest, but those events seemed too remote and far away on television to touch us directly until we left home. I'm looking at our Levine/Adler family pictures now as I write. They were also posed but so different. Our photographer, Marcy Stein, just followed us room to room, snapping shots as we tooled around the house.We were so comfortable we forgot to put shoes on. My kids may not want these photos when it's time for us to downsize, but I think they will. I aspired to create a dynamic, not static life for our family. I wanted the four of us to be in relationship, in movement with and responsive to each other. Maybe it's because our kids have two parents with a good dose of ADHD. Maybe it's because we adore spontaneity and both work with kids. Maybe it's because our parents provided us with so much security that we felt free to be adventurous. I'm going to be very cautious when entering my sister's house next. Who knows what else she may find? *They already have a realtor.